LONDON • Pep Guardiola remains confident in Sergio Aguero's penalty-taking ability despite the striker's latest miss, against Everton on Saturday, which means the Argentinian has now missed a total of nine from 38. Since missing two at Dinamo Bucharest early in the season, Aguero scored from the spot against Stoke City and Swansea as well as against Borussia Monchengladbach in the opening Champions League group game, but then missed in a World Cup qualifier against Paraguay last week. "He's intelligent, so if he's not feeling confident like this, then he will say, 'I'll step back and let another guy kick the penalty.' Yes, he has the personality to take one at the Nou Camp (against Barcelona in the Champions League tomorrow)." 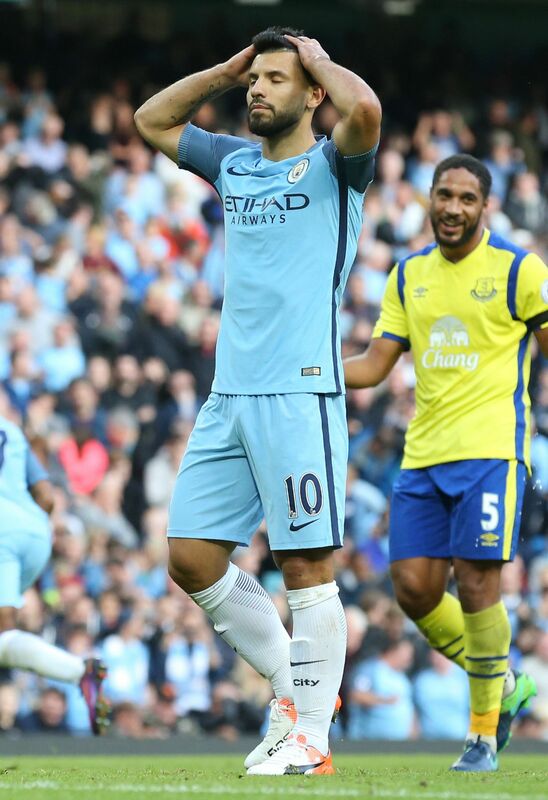 However, Everton manager Ronald Koeman believes Aguero may now have a "mental question" regarding penalties. Number of penalties Sergio Aguero has missed in his career. Spot kicks the Argentinian has missed this season for club and country, with his latest coming against Everton last weekend. The failure at the Etihad Stadium was his fourth of of this season. The striker's unsuccessful attempt came in the second half after he replaced Kelechi Iheanacho and after Kevin de Bruyne also missed from the spot before the interval. Goals from Romelu Lukaku and Nolito on 64 and 72 minutes shared the points to stretch City's winless run to three games. Koeman said: "Maybe it is a little bit of a mental question, maybe for Aguero, I don't know, because it is not the first time that he has missed." Koeman, who was a team-mate of Guardiola's at Barcelona during their playing days, is certain that City will pose a threat to Luis Enrique's side tomorrow but warned they may be picked off. "They are strong enough as a team to get a good result but you play against Messi, Neymar and Suarez and you can score out of one chance but Barcelona get four chances and they could score three times. "That's the problem for them on Wednesday - the individual qualities of Barcelona (are) so extremely high. But City can beat Barcelona. "They will also have the ball and I think it is the best game you can watch between the philosophy of two teams and it is a really high standard of football. I'm really looking forward to seeing that game. "The way they played (against Everton last weekend), the way they showed to the fans of City - it was a great performance but the result is not what they maybe deserved. But if they go on in this way, with this football and they keep everyone fit (it can be) perfect."